Are you considering what to use when taking videos for your trips and special occasions so that you can recapture those magical moments? 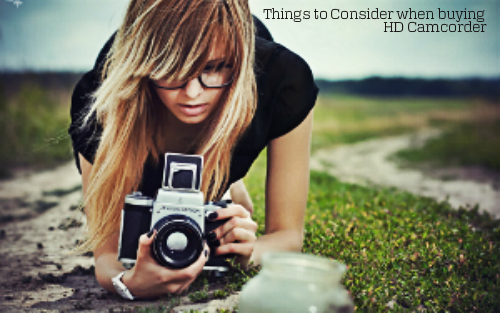 Don’t worry, there is the ultimate solution for that: the HD camcorder. Recording on HDD gives one a high record time due to its capacity of up to 120 gigabytes. This medium is however a bit fragile and one has to routinely back up on a separate hard drive or DVD or else one will lose valuable footage. This is where a lightning USB cable or a USB 3.0 docking station, so that you can enjoy watching your videos in bigger screens. Flash drives may be the most convenient of all as they consume less battery power, are compact, and removable. However, it does not have the large storage capacity compared to the HDD thus recording time can be limited. This can be solved though by bringing extra flash drives as these are becoming more affordable these days. Footage from flash drives also need to be transferred to a DVD or a hard drive for archiving. All of the non-tape media types are easier to transfer to a computer for editing via USB. Another thing to consider when buying HD camcorders is the compression format. This would be important during the editing process in terms of computer software compatibility and in converting the video to files. Widely used and considered to be an entry-level format is the HDV format. It has wide compatibility with most editing software. HD camcorder swith this format record only to MiniDV tape and in 1440 x 1080 footage resolution which is then stretched to 1920 x 1080 during playback. Next on the list is AVCHD which stands for Advanced Video Codec High Definition. This format paved the way for HD video to be recorded on non-tape media. However, one will need a high-end PC with a powerful memory and processing power to support playback and editing in this format. The H.264/MPEG-4 AVC video compression format gives quality video at lower bit rates and records at 720p resolution. There is also the MPEG-2 Transport Stream which allows high quality HD editing. The camcorder is used in a variety of shooting environments depending on the user wielding it. It is used to mark personal milestones in the family like one’s kids, pets, birthdays, graduation ceremonies, weddings, or to record events like family vacations. In the social sphere, it is an indispensable tool for the media most especially news organizations. The movie industry also depends on this machine whether making blockbuster productions or small independent films. The type of HD camera one should buy will depend on the user as he deliberates which resolution format, media type and compression format would suit his needs and, more importantly, budget.